The book is The Lord of the Rings in one volume from 1969, published by George Allen & Unwin. We can assume this will be the 4th impression of the One Volume Edition with Pauline Baynes covers, that was first published in 1968. And that it is a paperback edition (2). While the book is described as creased and rubbed, the authograph seems to be authentic. The book also comes with an excellent story, which makes the book even more attractive and special. "The owner's wife's family were friends of Doctor Tolhurst, who attended Tolkien during his last illness. The owner notes that his wife's sister accompanied the doctor "to visit with some books to sign. He [Tolkien] signed several and when they were leaving they remembered that they had left mine in the car so they brought it back for him to sign. Later that evening he was taken into hospital and died"." The story in itself is very nice and probably very close to the truth, but some details are absolutely wrong. I'm convinced that the book was indeed signed by Tolkien and indeed by a friend of Doctor Tolhurst, yet I very much doubt about the timing. Tolkien attended the celebration for Mrs Tolhurst, Tolkien's doctors wife on the 30th of August. Probably it was during this celebration that Tolkien did sign some books; of which this one is most probably the last one. During the night after the birthday party Tolkien was in pain and did not feel well. Only next day (and not that same day as Bonhams writes) Tolkien was hospitalized and he died on the 2nd of September, early morning, 3 days after the celebration of Mrs Tolhurst (3). 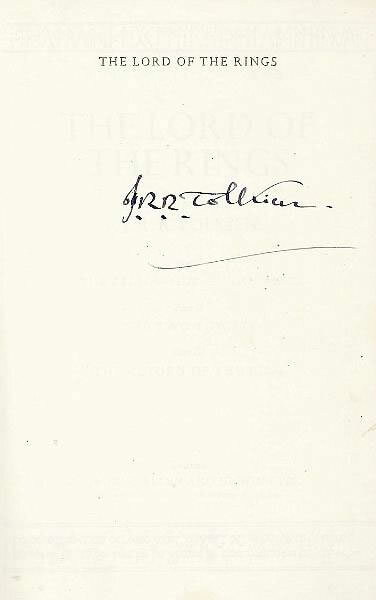 While the book in itself is not a collectable or valuable edition, the signature really makes this Lord of the Rings paperback stand out and I believe the tale behind the book makes it a very valuable Tolkien collectable that could become a center piece of someones Tolkien collection.